Recently I placed an order online for a replacement tool component. The supplier promptly fulfilled my order which was collected by the courier company, who then advised me they had the package and I could check its delivery via their website. I have posted the tracking information from their website below. As you can see they picked up the package in Perth at 10:59 on 28 December. The estimated delivery date is 31 December. FOUR DAYS to deliver a package in the same city!!!!!! Actually it’s worse than that. The supplier is within walking distance of our house. And the name of the courier company is FASTWAY. Oh how we miss those UK overnight deliveries. On a more positive note. The latest electricity bill has arrived. This time they correctly read the meter and our bill for the last two months is $4. OK, the panels were installed in late September, which means the next bill will be slightly higher. However the house Chief financial Officer (CFO) now has a problem. The utility company website refuses to accept payment for such a small amount! Oh….. Happy New Year. I shan’t be awake to see it arrive. At my age I need all the sleep I can get! OK, it’s only the 12V distribution board that has been completed…. But it’s a milestone! I have to mention it was darned hot during the entire time it took to test and fit the board. However I’m not complaining as other parts of the country are experiencing temperatures in the mid to high 40’s. The first test was whether the solar panels would charge the battery. They weren’t! I tracked the problem down to a partially fitted pin connector in one of the Anderson plugs. 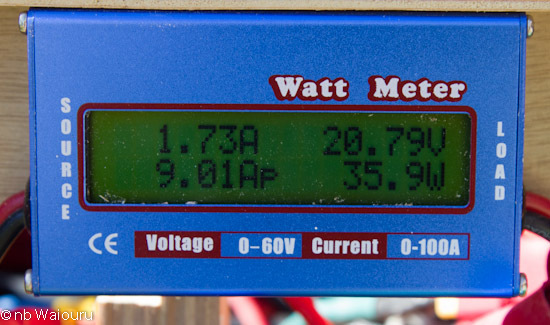 With that rectified the Watt Meter sprang to life. 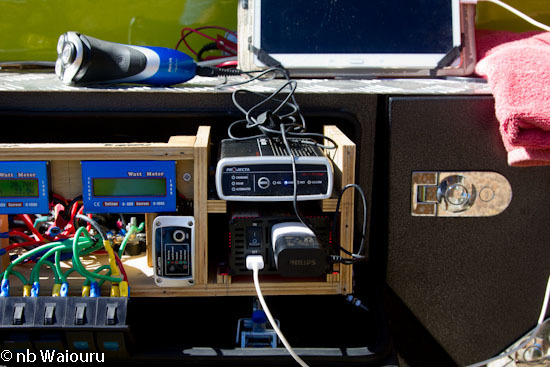 The power cable between the trailer and solar panels was then connected between the trailer and the 4x4 to test whether the vehicle alternator would charge the battery via the DC to DC charger. 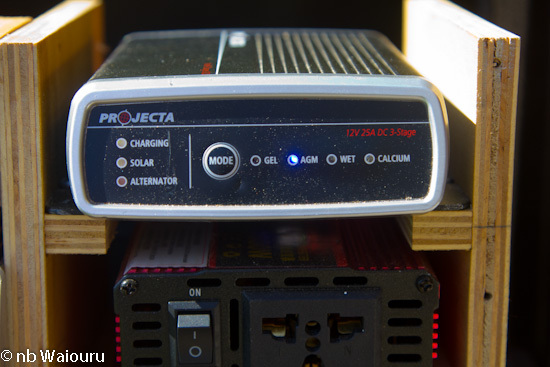 You may be able to see the illuminated Alternator LED in the bottom left of the Projecta DC to DC charger. 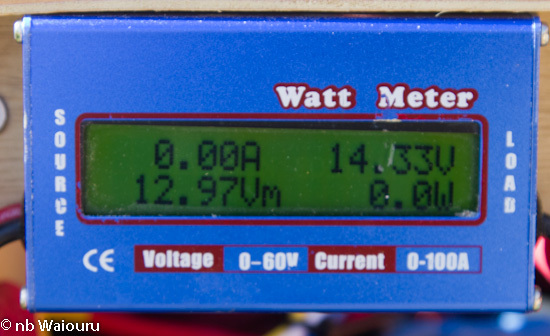 The last test was the 12V to 240V inverter. First I tested the USB port by connecting it to the Samsung Tablet. <success>. Then I plugged my electric razor into the 240V. It started to charge! 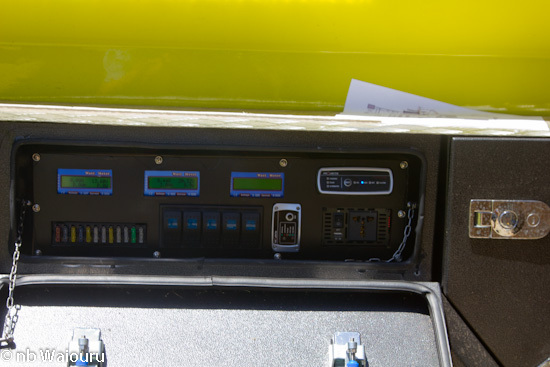 With everything now working I fitted the front panel before installing the board in the trailer compartment. 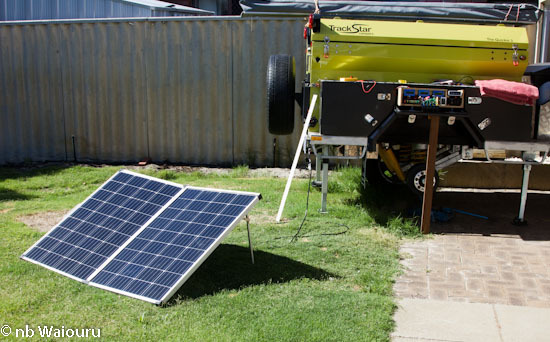 The solar panels are once again connected to the trailer and the battery is being charged. Time to move on to the next stage of the build. Well Christmas is over! How do we know? The supermarket has stocked the shelves with hot crossed buns and the Easter Eggs are starting to appear. Consumerism at its worst! The next problem was identified as a defective Watt meter which I’d fitted between the battery and the rest of the trailer electrics. Bypassing that resulted in the 12V distribution board finally working. But I decided not to do the final installation until I’ve tested all the trailer electrics. Jan doesn’t appear very impressed with her Christmas presents. I’ve ordered everything on eBay using a 10% discount voucher. Sometime during the next week she should receive a pair of fishing sunglasses, a head for the gas torch and a pair of 1200mm drawer slides for the camper trailer. Meanwhile I have to decide what to do with all the sheets of piano music she has ordered for me! Purchasing a storage battery for our house solar system isn’t currently viable. The payback period on the cost is about 15 years but the batteries only have a useful life of 10 years. This is one reason why I’ve been considering the idea of making my own battery. The question is “What is the required battery storage capacity? I’ve started to identify that by using data collected from the two power monitors I’ve connected to the house. One measures the total amount of electricity generated by the solar panels and the other measures our consumption. By subtracting the total electricity consumed from the solar power produced I can calculate the surplus solar power being returned to the grid. Sometimes we use more electricity than we produce. This has to be purchased from the utility company. My spreadsheet calculates how much electricity we purchase on a daily basis. During December it peaked on one day at 7.6kWh and it averages approximately 5kWhs. Of course we are likely to have less sunshine in winter and will corresponding need to purchase more electricity during that period. So a 10kW battery appears to be about the right size. Obviously I also need to ensure we have sufficient surplus solar electricity to recharge the battery on a daily basis. Assuming we recharge the battery daily and need to add 50% to the battery capacity in order to achieve this then we require 15kW daily (31x1=451kwh). This month we sent a total of 641kwh back to the grid. The power company pays us $0.07 for every kWh we send to the grid which means we would earn $13.30 for our surplus electricity after recharging the battery. There is a daily service charge of $0.97 or $30.07 for the month. Deduct the $13.30 from the service charge and we would have a monthly power bill of $17.27 despite using no electricity from the grid. The pool did look inviting. My brother wanted to show me the fish farm he has in their back yard. It’s a closed cycle system with the water from the fish tank being pumped back through two gravel beds where the nutrients from the fish effluent converts to nitrates which he uses to grow their vegies. This process also oxygenates the water which is then gravity fed back into the fish tank. Of course they eat both the fish and vegies. The small people kept eyeing the pile of presents but were quite good with their patience. We were back home before 2pm which is when both of us discovered we needed to examine the inside of our eyelids for an hour. When it had cooled later in the day I went out and resolved one of the problems with the trailer 12V distribution board only to discover there was at least one other issue. Hi Kevin Too. We hope you are enjoying your Christmas and envy the cold! Hello Pip & Mick. An interesting Christmas mooring. Should be very quiet! Ade, you and Karen have a great Christmas and a safe New Year. I'm still considering what to by Jan for her new workshop. Patience is a virtue! Geoff & Mags, Sue & Vic. Jan says thank you for the cards. Another year almost gone. It’s hard to believe 19 months have passed since we relinquished our idyllic cruising lifestyle for all this continuous sunshine. I did spend 30 minutes before 9am working on the trailer electrics before being driven back inside by the heat. Jan pegged out the dripping laundry (for 10 minutes) and is now folding it ready to go back in the drawer. Two people have been stung by the deadly blue ring octopus and three bitten by sharks. We’re not going to the beach to cool down! My brother’s pool is starting to look very inviting. Will there be room amongst the rest of the relatives and friends? Below is a short video <3300kb>. It should not consume much of your download allowance. Double click on it to view the video. OK, we’re experiencing a heat wave. Yesterday the temperature in our suburb exceeded 40C. It was probably slightly cooler at the coast as there would be a sea breeze coming off the Indian Ocean. I do pity the recently arrived UK tourists. Last night one was interviewed on the TV News and commented “Two days ago I was in England and it was 2C”. Quite a shock! I attempted to do some work on the trailer wiring this morning and was driven back inside after a few minutes as I could feel the sun burning through my thin TShirt. The wiring can wait. Actually I burned my hand touching the metal on the trailer two days ago! Jan has gone all green using renewable energy (wind and solar) to dry the laundry. Actually she only has to peg it out for 10 minutes on her new line before it’s dry. Apparently tomorrow and Christmas Day aren’t going to be much cooler. We have been invited to my brother’s for Christmas Brunch. They have a swimming pool which will have an instant cooling effect should we get too hot. Jan says she misses winter on the boat! I (finally) managed to fit the battery under the trailer. As they say…. a picture is worth a thousand words. The front end of the plank was packed up with two tiers of clay tiles. Then I jacked up the rear end with the trolley jack. The battery was two thirds the way along the plank. Once the jack had reached it’s full extension I packed underneath the battery to make a fulcrum point. The process was then repeated until the battery was correctly positioned under the trailer. Of course nothing is easy and I discovered in making the steel “saddle” for the aluminium battery shield the bolt holes had moved slightly. Eventually this was resolved by enlarging the holes from the original 10mm to 13mm. Then I couldn’t tighten the bolts. They had a 16mm hex head and I only had a 17mm socket. The area was too confined to use an adjustable spanner which meant a trip to the hardware store for a 16mm socket. Eventually the battery box was “in”. I now need to install the wiring conduit. I then decided to return to the project of replacing the unserviceable NiMh batteries for the old Panasonic drill with lithium. I was unsuccessful with my first attempt and this time tried a different method. The NiMh cells had been removed and I replaced them with three Li-ion cells from an old laptop battery. Lithium cells need to be ‘balance’ charged and I’d bought a balance lead from eBay ($1). My new battery has two external leads and is designed to be recharged by my iMax B6 charger. One lead is the main 12V charging lead and the other is the balance lead. 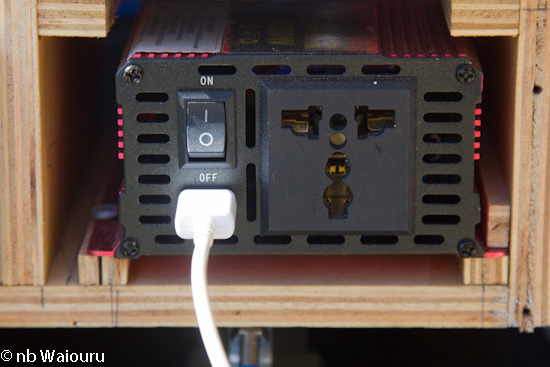 Both plug into the iMax to recharge the battery. The battery was plugged into the drill after being on charge and the drill DIDN’T work!!!! Eventually I decided to dismantle the drill. That’s when I discovered the battery terminals inside the drill were corroded. After fixing the problem the drill worked <success> and the old drill now has a new lease on life. Total cost of the conversion was $1 for the balance lead. Now I know the problem was the battery terminals inside the drill I’m going to try out the earlier method using the balance circuit board on a second battery. Jan mentioned the excessive heat from the sun on the northern side of the pergola several months ago and so whilst we had the borrowed trailer it seemed like a good idea to purchase shade cloth and some timber to make a screen over the affected area. Whilst I measured the area Jan painted the 70x30mm timber which I planned to use as rails. Once the paint was dry I cut a 40deg bevel on one edge. The larger part of the timber was then screwed to the side of the pergola steel top plate and the smaller portion nailed to the existing 4x2 horizontal timber at the top of the fence. The next step was to screw the shade cloth fixing strips. Each one is 600mm long and has barbs to secure the cloth. If I’ve measured the bevel angle correctly the upper and lower line of retaining hooks should be on the same plane. It was then a case of attaching the shade cloth to the hooks making sure everything was smooth and taunt. At this stage the job is 80% complete. I need to make some timber framing for each end which will run between the upper and lower ends. This will stop the ends of the shade cloth from fraying and flapping in the wind. I plan to cut off the surplus shade cloth at the bottom on the fence side folding the edge up and then screwing some timber capping over it to make everything secure and tidy. The other task is the installation of the trailer battery. My days of using brute force to lift and move heavy objects are over. I’m reverting back to schoolboy physics using the principle of levers or ‘turning moments around a point’. The first step has been to remove one of the long timber bearers from the garden edge and lay it under the trailer. The plan is to raise the battery into position using a “see saw” motion. I’ll place two tiers of old bricks under the far end of the plank, then position the battery in the middle of the plank directly under the position it needs to be secured on the trailer. I’ll then use the car jack to raise the near end of the plank. Once the plank is parallel with the bricks at the far end I’ll stop jacking and place two tiers of bricks directly under the battery. Then I’ll lower the jack end and place another two tiers of bricks under the far end. I’ll repeat this cycle until the battery is in position under the trailer and ready to have the securing bolts installed. It will be interesting to see if the plan works. It’s so darned hot outside I’ve decided, as a retired man of leisure, I can wait out the heat inside the air conditioned house. Further north the temperature is forecast to reach 46C whilst in our suburb the temperature is in the mid to high 30s. Actually its been so hot the bituminous paint and Sikaflex on the battery box are still sticky. Yes…. I discovered that the hard way! Meanwhile on the other side of the continent two storm systems have collided bringing torrential rain. No doubt that will bring some relief from the drought stricken farmers, but I also expect there will be significant local flooding and corresponding property damage. Everyone’s insurance premiums will be risking next year! As someone on the outside looking in I'm fascinated by the machinations of BREXIT. Will the UK roll over and remain; will there be a second referendum; or will it leave without a deal and move to WTO rules. Back in 2013 the then PM, David Cameron made a speech promising to renegotiate EU membership should the conservatives be re-elected. The Conservatives were re-elected and Cameron attempted to renegotiate the UK's membership. In early 2016 he advised the nation of the results of his negotiations and a referendum was held. Cameron's deal was rejected and the majority voted to leave the EU. Theresa May was subsequently elected as the new PM. She had campaigned to remain but stated she was committed to exiting the EU. Almost 21 months have passed since the UK formally notified the EU of its intention to leave and the negotiated 'deal' looks almost certain to be rejected by parliament. The PM has seen a number of members of her cabinet resign; including two BREXT secretaries supposedly responsible for negotiating the new arrangements with the EU. One can only assume both of them found their position untenable through meddling, isolation and overruling from No10. The current deal appears to be solely owned by the PM. I suspect in her efforts to please everyone she has managed to please no one. It would be political suicide for Theresa May to roll over and withdraw the notification to leave. Actually it would probably be political suicide for the major parties. There could be a second referendum. However since 2015 the British people have had three opportunities to clearly show they wish to remain in the EU, but the 2016 referendum showed a majority wanted to leave. Will the British be like the Irish, Danes, French and Italians continuing to vote until they give the "right" answer? What is so frightening about WTO Rules? The majority of other nations successfully trade using them. Moreover the UK already uses them when trading with non EU members. It was interesting to note what happened on the UK stock exchange when Theresa withdrew her "deal" from being voted on by parliament. The value of shares fell..... but nowhere as far as the share prices in the EU! It's my belief the EU either needs the UK as a member or as a vassal state (ie, Norway) and the bureaucrats in the EC are gambling this can be achieved. Finally, consider that whilst the British political establishment tears itself apart over the contents of the proposed deal, the leaders of the 27 other members of the EU took a mere 40 minutes to agree and accept the negotiated deal. Not hard to see who thinks they got a good deal. I believe the current deal is a Win - Lose rather than a Win - Win. But then the EU wasn't looking for a Win - Win. The trailer battery box was finished this afternoon. I drilled and tapped holes (ie, drilled holes and then threaded them) before applying a bead of Sikaflex around the perimeter of the aluminium shell to create a waterproof seal between the shield and the lid. The lid was then secured with M4 stainless steel machine screws. The box should now be waterproof. It doesn’t have to look pretty because the lid will be underneath the trailer floor. I now have the rails installed inside the trailer compartment. They will be finished after a coat of paint. A sheet of 18mm plywood (red line) will go horizontally on top of the top rails dividing the compartment. Access to the top will then be via the hinged lid and the bottom area via the tailgate. The left side rails are the exact width of the storage boxes I made for the first outback trip. The first box will be my dry goods pantry and the second will contain spare parts, etc. There will be a long sliding platform on the right. At the front will be the fridge with a storage compartment behind. The modifications to the tailgate hinges are also finished. As mentioned previously, I cut the back out of each hinge which would have weakened it. To rectify this I made four triangular steel gussets which have been welded above and below the hinge providing more strength. The steel support cradle I made for the battery shield has also been completed. Today I gave it a protective coat of thick bituminous rubber paint. The AGM battery was also fitted into the plywood battery box (rear arrow). Tomorrow I’ll buy a piece of thin sheet steel plate which will go on top of the aluminium battery shield sealing the battery from any water. With a little luck the battery will be installed on Wednesday.